4* Oman Air cheap return flights from Milan to beautiful Zanzibar from €336! Air China cheap return flights London to Asia from £328! Cheap non-stop flights from Ireland to New York from €287! 4* Oman Air has just discounted their offer from Milan to Zanzibar even more now offering round trip flights already for €336! This is including all taxes and fees, in-flight meal and checked bag. Looking for an affordable tropical holidays this is excellent opportunity to fly to Unguja, one of the two main islands of Zanzibar Archipelago. Good thing about Zanzibar is that you can find very affordable accommodation close to famous beaches of this tropical island. If you do not travel right in the peak season I suggest you can book your hotel upon arrival. Oman Air promo promo sale offers the cheapest flights in travel period from 2nd of September to 14th of December 2018 or 9th of January to 28th of February 2019. This is based on date of your outbound flight from Italy to Zanzibar. Max stay 3 months. Promotion is running till 10th of July or until sold out. Currently there is great availability of the cheapest flights during entire validity of this tariff. This is great option for travelers in Italy also those of you who can easily reach Milan. You can check the cheapest onnecting options via Skyscanner. Looking for an affordable accommodation in exotic Zanzibar you can use Booking.com. or consider following promo codes offered by Hotels.com, Hotelopia or Agoda. 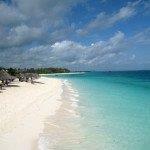 Booking sample of 4* Oman Air cheap return flights from Milan to beautiful Zanzibar from €336! As per our booking sample your outbound flight from Italy to this exotic holiday destination in Africa would be on 29th of January. Your inbound flight from Zanzibar back to Europe then on Friday, 8th of February 2019.